If you are part of the blogger circuit, you may have seen the posts with the hastag #princesbrekkie. It is all about eating healthier, and making breakfast part of our five a day. Princes chose some families and sent us a box full of goodies. In the box was a USB stick with some recipes that we could use with the tins of fruit that we had received. Princes recipes have lots of ideas for what we can do to reach our five-a-day. Fruit and vegetables are thought to be one of the best sources of vitamins, minerals and fibre, helping us all to stay healthy. 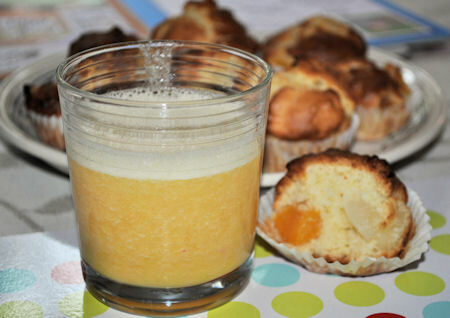 We chose to make the peach muffins but we doubled the recipe and added pears as well. 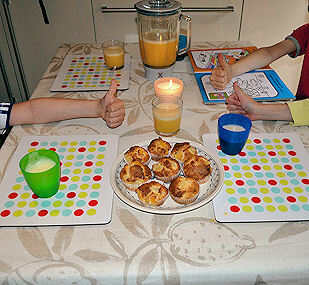 In the picture the muffins look burned, but they really were not. Sadly there are none left to retake another one to show off to you, as they were demolished by the boys very quickly. We also made the peach and orange smoothie but again, doubled the recipe and as I had used the peaches in the muffins, we made the smoothie with pineapple and fruit cocktail. We were planning having muffins and smoothie for breakfast the next morning and I was about to put the smoothie in the fridge, but the boys over ruled me, and it was eaten for Sunday tea. They loved the new place mats and we had the candle burning well into the night. Thank you Princes, we had a lovely afternoon making new things. I have teamed up with Princes to offer you one of these breakfast boxes to help you take the stress out of the morning routine. Princes prides itself on offering good value, great quality food that the family can enjoy. From canned fruit for your cereal to pure fruit juices for a refreshing morning drink, pack your cupboards with these trusty Princes products and you can whip up a healthy, delicious breakfast in minutes. 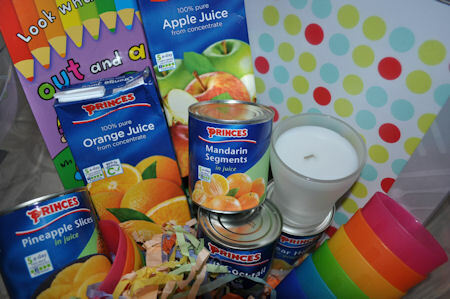 The Princes breakfast box includes a set of six bowls and six tumblers, table placemats, an alarm clock, a colouring book to entertain the kids, a relaxing candle for the mums, money-off coupons and, of course, a range of Princes canned fruit – including grapefruit segments, peach slices, pear halves, fruit cocktail, pineapple chunks and mandarin segments – and Princes pure juices. Pass on the competition to your online friends by tweeting or messaging. If you don’t claim your prize by the 18th October I will redraw another winner by a random generator. I like the Princes Fruit Cocktail. Always lovely juicy fruit. Lovely juicy pineapple is my favourite. I occasionally crave Princes pilchards in tomato sauce – reminds me of being pregnant! i must say i love fruit cocktail with condensed milk!!! ooh, pineapple for me, gorgeous! Got to be peach pots for me!! Following and have retweeted – @msetoonie! I love pineapple chunks in juice. I leave them in the fridge when I’m on a diet and just eat some when I want a snack. I love gorgeous sweet peach slices in juice, perfect with evaporated milk! Pineapple rings everytime. A childhood favourite. It’s got to be pineapple….my absolute favourite!! Pineapple chunks in juice – always have them in the cupboard! Peaches in juice – brings back childhood memories. Tweeted as @beachrambler. Princes pineapple slices in juice – they are so versatile because you can use them in sweet or savoury dishes or eat them on their own. And unlike fresh pineapple, they don’t stop jelly from setting. I love Princes Fruit Coctail! You can’t beat a good old fruit cocktail!! i love their pineapple !! My favourite fruit from the Princes website is Fruit Cocktail. 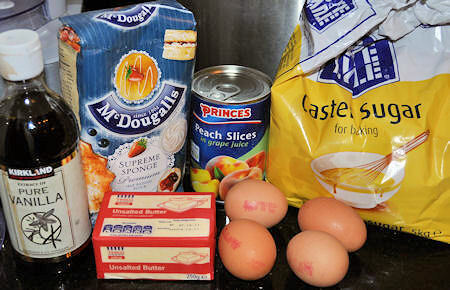 My favourite has to be Princes Tinned Peaches. I t reminds me of being a kid and havingpeaches and cream for desert. Pineapple! Or spiny apple as it is known in our house. My favourite fruit is mandarin oranges. They’re delicious on their own or in a fruit jelly. Impressed the muffins looked lovely! My favourite of Princes prouducts are the Tinned Pears. They are fantastic blended up with natural yougurt and my whole family love it! I adore the pineapple chunks, they taste so fresh and yummy. Strawberries in syrup, imagine they would be divine with vanilla ice-cream! The muffins look great ! Princes Pineapple chunks are lovely and so convenient already chopped and ready to serve. My all time favourite is pineapple slices in juice – they are so versatile and can be used in sweet or savoury dishes. Princes’s Pears for a quick pudding. pineapple every time for me! I love princes pineapple, my favourite fruit. mine would be the pineapple chunks! my fave Princes fruit has to be pineapple, doesn’t matter how it’s sliced it’s so much easier than a fresh one! I love Princes Fruit Cocktail.